The Apinajé are classified as Western Timbira and are characterized by a sophisticated social organization comprised of various systems of ceremonial moieties and relatively populous villages. In the second half of the 20th Century, however, they suffered major depopulation and social disorganization, when their territory was invaded by hundreds of migrant families and they had their lands cut by highways, such as the Belém-Brasília and the Trans-Amazonian highways (see "History of contact"). The route of the Trans-Amazon directly led to the exclusion of a part of their traditional territory during the official demarcation of their lands, which they have been trying to recover. Jovem apinajé paramentado e dispondo de arco e flecha cerimoniais. Foto: Curt Nimuendaju, 1931. Apinayé or Apinajé is not the self-designation of the group, but it is presently the name by which they call themselves and are called by other Timbira groups and by their regional neighbors. In Eastern Timbira vocabulary, the suffix yê/jê designates collectivity. 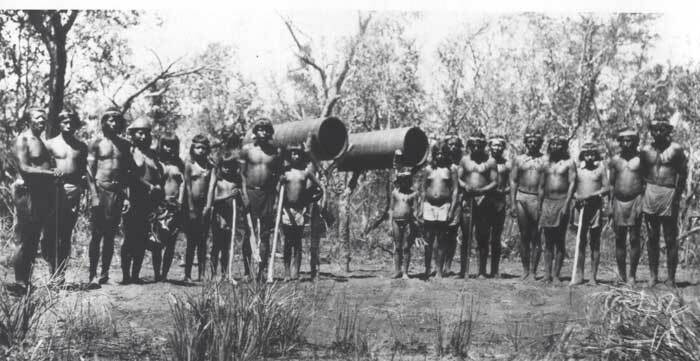 Curt Nimuendajú provided other names for the group, all of which were derived from the term hôt or hôto among the Eastern Timbira, which means "corner, angle, nook" and refers to the traditional territory of the Apinajé located in the "angle" formed by the Araguaia and Tocantins, a region known as Parrot’s Beak. The Apinajé have never left the region they traditionally inhabit, the area of the junction of the Araguaia and Tocantins rivers, the southern border of which was, up until the beginning of the 20th Century, formed by the Mosquito (in the Tocantins watershed) and the São Bento (on the Araguaia) rivers. Presently, the Apinajé Indigenous Land is located in the municipalities of Tocantinópolis, Itaguatins and São Bento, in the extreme north of the State of Tocantins. The Apinajé Indigenous Land covers an area of 141,904 hectares, and is homologated and registered in the CRI and SPU (Dec. 90969 of 02/14/DOU 02/15/85). The Apinajé, however, are demanding the amplification of the area, and the Funai, in 1994, established a work group to identify the indigenous area called Apinajé II; this process since then has been going through bureaucratic channels in the indigenist agency to determine the landholding situation of the region. From the point of view of the conservation of local ecossystems, the Apinajé Indigenous Land is relatively well preserved, having rapidly recovered from the degradation caused by the presence of more than 600 families of the non-indigenous regional population on their lands up until the demarcation of the area was completed in 1985. TO 134: from the municipality of Anjico to the junction of BR 230, continuing on to Tocantinópolis; part this road forms the southern border of the area. This road, which was recently asphalted, passes a few kilometers from the village of São José. Up to 1999, BR 230, better known as the Trans-Amazon, crossed through the Apinajé territory for approximately 30 kilometers and continued on as the border of its western part. In June, 1997, the IBAMA [Brazilian Ministry of the Environment] interdicted highway construction, in the stretch between Araguatins and Estreito, demanding environmental licensing to continue the construction work. After public hearings and a paralization of the asphalting of the highway by the Apinajé, there was a change in the official routing of the road. From the highway circle of Prata, as is it called, BR 230 goes on to Nazaré, with the name of TO 134, whence it continues on to the municipality of Lagoa de São Bento. These data demonstrate a demographic increase above the Brazilian average and project a population increase on the order of 10% per year. Apinajé paramentado com cocar de penas de arara. Foto: Curt Nimuendaju, 1937. The first "civilized people" to reach the territory occupied by the Apinajé were the Jesuits who, between 1633 and 1658, undertook four expeditions up the Tocantins, for the purpose of persuading the Indians to "descend" the river to the villages of Parà. As the routes along the Araguaia and Tocantins were opened up, contacts with the indigenous groups which inhabited this region became more constant and the references to the Apinajé ever more precise. Several colonial expeditions traveled along the Araguaia and Tocantins rivers in the first quarter of the 18th Century, coming not only from the south, but also from Maranhão and Pará, which disputed possession of the rich gold veins recently discovered by the bandeirantes of São Paulo in the south of Goiás. Until the end of the 18th Century, the Apinajé at various moments entered into hostile contacts with the "civilized" people, undertaking " raids" on the Tocantins to take possession of iron tools. As a result of these raids, in 1780, the military post of Alcobaça was founded, which, despite its six pieces of artillery, was abandoned due to the incursions of the Apinajé. And, in 1791, another military post was founded on the Arapary river. In 1797 the post of São João das Duas Barras, present-day São João do Araguaia, was founded. This fact marked the establishment of permanent contact between the Apinajé and the national society. However, the relations between the garrison and the Indians continued to be marked by conflict. In 1810, a merchant founded the place called São Pedro de Alcântara. Establishing friendly relations with the neighboring Krahô, the Apinajé used them to attack other indigenous groups. In 1826, the first settlement, Santo Antônio, was founded in the same territory then occupied by the Apinajé, slightly below the rapids of Três Barras. The Apinajé at that time had five villages. In 1816 this town was incorporated to São Pedro de Alcântara, then forming the city of Carolina, on the Maranhão side of the Tocantins. In 1824, the small town of Carolina had a population of 81 "whites" and around 120 to 150 Apinajé. 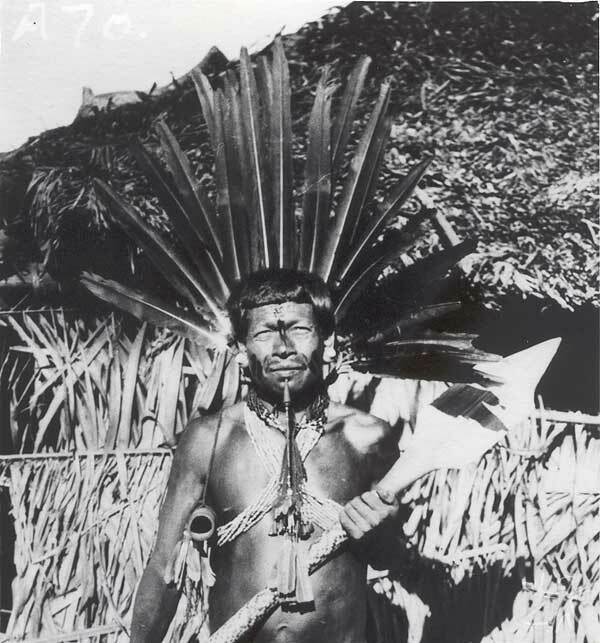 In this same year, Cunha Mattos located the Apinajé in four villages with an approximate population of 4,200 Indians. In 1831 Boa Vista was founded, which would become present-day Tocantinópolis, joining together a small northeasterner population, probably consisting of refugees from the frequent conflicts among Northeastern political bosses. In 1840, Frei Vito founded a mission in one of the Apinajé villages, extending his influence to the other three, reaching a total of approximately three thousand Indians. The oral tradition of the Apinajé does not contain any mention of this mission settlement, and only makes mention of the foundation of Boa Vista from the time of the arrival of Frei Gil Vilanova, at the end of the 19th Century. In 1850, 31 commercial boats were already sailing along the Tocantins regularly, employing nearly 500 people, while the navigation of the Araguaia continued to be heavily dependent on government help. But even in the second half of the 19th Century, the Apinajé population was numerically expressive, as shown by several official business reports of the Province at that time. In 1851, the settlement of Bôa Vista was calculated to have 2,822 Indians. In 1877, a new provincial report indicated a population of 1,564 Apinajé, explaining the population decrease to be the result of a measles epidemic. At the end of the 19th Century, the occupation of the region of the Apinajé became more systematic, initiating a history of conflicts for possession of the land in the place. The consequences of this occupation were devastating: at the same time that the " White" population increased, the Indians suffered a drastic decline in their population. 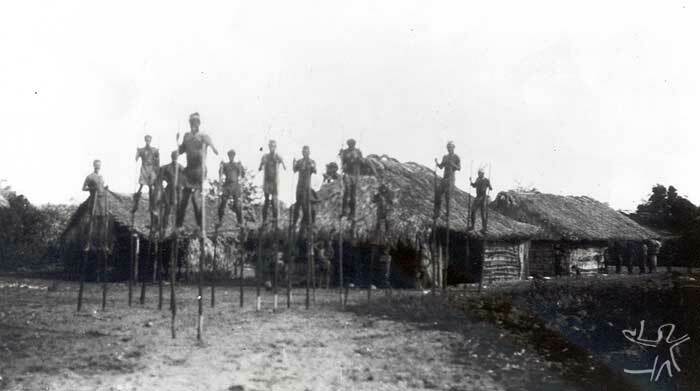 In 1897, Coudreau estimated the Apinajé population to be around 400 people and at the turn of the century, Buscalioni, in his expedition to Goiás, visited the Apinajé of the village of S. Vicente and calculated its population to be around 150 individuals. Thus the Apinajé, who until then had been the most significant human group of the region known as "Parrot’s Beak" or "Triangle of the Tocantins" , entered the new century as an insignificant minority compared to the regional occupants who then were in process of landholding occupation. In the first years of the 20th Century, a babaçu extractivist front reached the region of the "Parrot’s Beak" , adding to cattle-ranching as one of the principal economic activities. In this region, different from what occurred in the rubber and castanha extraction zones, more to the north, no economic activity was dominant over the others. Cattle-ranching lost its force when the Northeastern expansion front crossed the Tocantins, due to the difficulties of transporting the cattle to the consumer markets of the Northeast. Babaçu, which was sold for less and was less affected by fluctuations in the international market, unlike rubber and castanha, never came to involve all of the population of the municipality. Thus, the settling of the Apinajé territory occurred in a relatively constant fashion during the 20th Century, without abrupt economic and social changes. This situation was fundamental for the survival of the Apinajé, even though the population diminished significantly in the final years of the 19th Century. (...) of their ancient territory, hardly a part of it is in the tribe’s possession, for the neo-Brazilian colonists are spread out over all of their traditional habitat, even though sparsely. Up to 20 years ago, no Apinajé even suspected that this might represent a threat for their future. To the contrary, they willingly accepted, for their apparent worth, the claims of friendship of the intruders, and when they opened their eyes it was already too late......all of their territory now has outside owners, and the little that is left runs the risk of being expropriated some day by some sufficiently powerful and unscrupulous rancher. The possibility of a certain conviviality between the Apinajé and the regional population existed due to the very form of occupation of the region by the national society: a dispersed population, living basically from subsistence agriculture, the raising of small animals and small-scale extraction of babaçu. This population maintained intimate relations with the Apinajé, such as, for example, relations of compadrio [ fictive kinship, relations of godparents], which is common in the areas of peasant populations in the country. 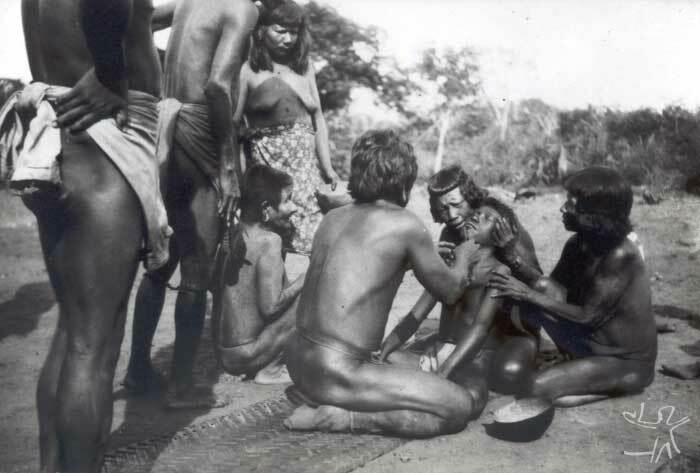 This type of relation was never possible, for example, in the areas of castanha-do-Pará nut and rubber extraction, where the organization of labor in the system of the rubber camps prevented any individualized contact with the Indians. This was, basically, the characterizing feature of the occupation of Apinajé territory by non-Indians until the 1940s, except for the eastern border (territory of the subgroup called Krindjobrêire and present-day municipality of Nazaré), which was occupied by cattle-raisers. Until 1940 there are also continuous records of epidemics (measles, fever, yellow fever) that decimated a large part of the Apinajé population. Around 1944 the SPI installed in the village of São José (still called Bacaba) an Assistance Post as a way of mediating these conflicts. No doubt the creation of the Post of the SPI helped in the demographic recovery of the group, which had already begun in the 1930s. Despite it’s not being able to avoid new invasions nor even to seek judicial solutions, the SPI institutionalized the practice of "leasing" as a way of showing to the regional population that they "inhabited land that was not theirs" . At the end of the 1950s these leases ceased to be collected and many of the older squatters ended up " selling" their possessions. With the establishment of the SPI post, the Apinajé were then encouraged by the employees of this agency to get involved in the gathering of babaçu nuts. From the 1970s on, with the Funai present in the area, they came to be pressured into producing babaçu on an industrial scale. The Funai substituted the SPI trading post with another that was more "business-like" in its dealings, as the intermediary for the commercialization of the babaçu that the Apinajé gathered. In 1976, the anthropologist Roberto da Matta noted that the Apinajé considered babaçu gathering to be a "necessary evil" : gathering and breaking the nuts was for them a distinctly negative activity when compared to the traditional activities of hunting and agriculture. First because it was a gathering activity and second, because it was an activity for selling which does not imply the same social obligations as hunting and agriculture. The resources of the CVRD/Funai Accord (after 1982) had the effect of consolidating this type of relationship of the Funai: in the village of Mariazinha, the Indians were being obliged to sell their production exclusively at the post, without the prior alternative of seeking a buyer who might pay better for the product, and which had as a "counterpart" the Funai’s sponsorship of large rice gardens, through "communitarian development projects" . Thus a work regime was formed in which the Indians of that village either worked in the "Project garden" or gathered and split coconuts for the canteen, both totally controlled by the Funai. 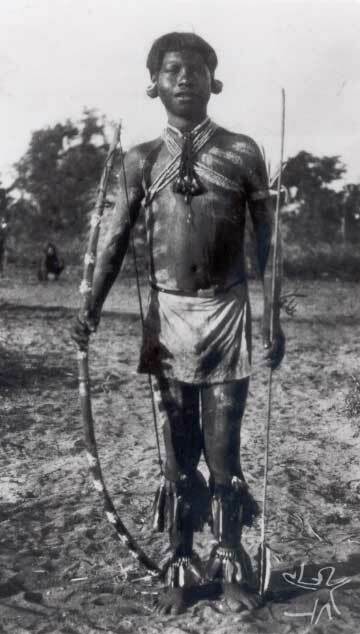 Hunting and fishing activities were only allowed on Sundays, the Indians did not have family gardens and they disputed the babaçu stands with the regional population. As a reaction to this system, the village of Mariazinha fragmented in the beginning of the 1990s, most of the families dispersing to other regions of the indigenous area, where they would go back to living exclusively from the subsistence gardens and from hunting and gathering of native fruits - like the other villages. To the north, in the village of Cocalinho, the lack of assistance from the Funai from 1990 to 1994 forced the families who lived there to permit the removal of timber of good quality, tapir beans and jaborandi by outsiders, through the payment of a quantity that would permit them to acquire some industrialized goods for the Indigenous Post. After 1995, with the removal by the Funai of the last invaders from that part of the reserve, this type of "leasing" has no longer been done by the Indians. If the process of occupation of Apinajé territory has been going on since the end of the 18th Century, increasing in intensity in the beginning of the 20th, without a doubt it intensified even more with the implantation of the large development projects in the northern region of Goiás, principally after the construction of the Belém-Brasília and Trans-Amazon highways, which cut through Apinajé territory. Along the latter highway there were even small nuclei of residents where the work camps were situated, during the physical demarcation of the Apinajé area in 1985. These nuclei which lived off the sale of meals, coffee, and cachaça to the highway users, brought numerous problems for the Apinajé, serving as poles for prostitution and the transmission of diseases, besides having devastated the surrounding area in 10 years of occupation, which the Apinajé did not do in more than a hundred years. Between 1975 and 1982 several work groups were established by the Funai for the delimitation of the Apinajé área; the process of physical demarcation of the area was initiated in 1979, but this had to be suspended because the Indians did not agree with the limits that were being imposed on them, to the extent they did not incorporate the strip of lands of the Gameleira and Mumbuca rivers. The Apinajé had part of their lands recognized by the Brazilian state in February, 1985, after they had blocked the Trans-Amazon and had initiated the demarcation of their territory " on their own account" , with the support of Krahô, Xerente, Xavante and several Kayapó warriors. During this tumultuous process of delimitation and demarcation of the Apinajé area, the MIRAD (the government agency then responsible for the recognition of indigenous areas) finally decreed an area of 142,000 hectares, changing the proposal that had been sent by the Funai and removing important areas situated on the Gameleira, Mumbuca and Cruz rivers. During the struggle for physical demarcation, this area was occupied by 641 invasions, involving a total of approximately 5 thousand people. These occupants received indemnities for their improvements and were intimated to leave the demarcated area only twelve years later, in April of 1997, with resources from the CVRD/Funai Accord. The only families who did not receive indemnity were those who resided on the northern border of the area, the region of the Pecobo stream, where the Funai had not done a land title survey necessary for calculating the indemnifications. After the demarcation, still in 1985 the Funai sent two work groups to redefine the borders of the Apinajé Indigenous Land, without, however, following up on the process. It was only on April 27, 1994 that the Funai signed Decree nº 0429/94, creating the Technical Group for Revising the Apinajé Indigenous Area. The Work Group so established included part of the area claimed by the Apinajé, but the process still awaits the execution of the land-titling survey on the area to be added as a condition for its being sent on its way for decision by the Ministry of Justice. Iniciação dos guerreiros novos. Moços e moças preparando as toras para a corrida. Foto: Curt Nimuendaju, 1937. Like the other Jê societies who inhabit Central Brazil, the Apinajé bear in common a sophisticated social organization comprised of several systems of ceremonial moieties and ritual groups, as well as relatively populous villages. They are predominantly hunters and gatherers, although they practice - more in the past than today - horticulture focused only on root crops. The adaptation of these societies to the environment of the scrub forest reached such a sophisticated level that it impressed the first Europeans who studied them who, perplexed, investigated how it was possible that societies so sophisticated could have developed, given that they had such a poor material base (that is, with no ceramics, no developed agriculture, no weaving), yet were demographically important and, above all, expansionist. In fact, prior to the disastrous contact with the Europeans - which began at the end of the 17th Century - these societies had circular or semicircular villages with 2 to 3 thousand people. Perfuração do lábio em ritual de iniciação. Foto: Curt Nimuendaju, 1937. The region of the cerrado [open land with patches of stunted vegetation], with its wide horizons - that facilitates easy movement (all Jê peoples are walkers and runners) and the possibility of simultaneously exploiting the diverse plant compositions that characterize the cerrado (galley forests, tracts of barren land, fields, etc.) has produced among the Jê what is called the "cerrado culture". Until the 1940s, the Apinajé firmly maintained their ritual system in operation - and with it all of the social and cultural structure that both drew them close to, and set them off from, the other Timbira. The photographs taken by Curt Nimuendajú among these Indians in the 1930s, are dazzling: the men are still naked, race logs are strewn throughout the village (a sign of the intensity of ritual life), the formality of the adornments and ornaments used by the young men and "associated girls" at the heights of the initiation rituals. Perfuração da orelha em ritual de iniciação. Foto: Curt Nimuendaju, 1937. The drastic depopulation that they suffered, together with their imposed involvement organized by the SPI and later by the Funai in productive activities of gathering and breaking coconuts, deeply interfered in their traditional system, particularly in their abandonment of the ritual calendar as a guide for their economic activities. Presently, after having their area demarcated and after a more intense re-approximation with the other Timbira groups, mainly through their participation in the Vyty-Cati Association, the Apinajé are revitalizing with great interest several of their rituals. In order to understand what constitutes a "territory" for the Timbira in general and the Apinajé in particular, it is necessary to know that a Timbira village constitutes an autonomous "local group", that is, it acts and presents itself politically before other villages as a unit. This autonomy is generated in and through a process of fission that leads several families to disconnect themselves from the mother-village, for various reasons (in general, accusations of witchcraft and rumors). But this autonomy only becomes complete when the new group really has the conditions for performing the most important rituals of the annual cycle without competition from the other villages. The unity of the local group is also shown in the position of chief (the pa’hi receives a mandate from the domestic groups to act autonomously in the interests of the village - krï) and in the exclusive use of a portion of the territory for hunting and gathering (when a new village is formed, the place where it is built is generally agreed upon with the remaining members of the original village, in such a way as not to overlap with their hunting territory, a constant source of conflicts between the villages). Thus, each village has its "chief" (pa’hi) and has autonomy in making decisions; there exists no other power, greater than the village-level, that would represent all the Apinajé villages (like a council of chiefs or something along those lines). The daily activities in the villages follow a ritual calendar that is regulated by the activities of the "patio", center of the circular villages and locus of political life properly speaking, and place of the men. There, every morning and at the end of the day, the men get together with the "governors" to decide on or evaluate the activities of the day (who will go to the garden, who will hunt etc.) or the activities necessary for the conclusion or continuation of a ritual in progress. The "governors" (always two young men) are chosen by the eldest men and necessarily belong to the seasonal moiety that "dominates" the village: if in the "Summer" (dry season) they belong to Wacmejê moiety; in the "Winter" (rainy season), they must belong to the Catãmjê moiety. The dynamics and fabric responsible for Apinajé social structure are provided by two connected systems of exchange: the exchange of names and exchange of spouses; these systems are the basis of, and determine the relations of alliance among domestic groups and residential segments of any and all Timbira villages. Homens sobre andas caminhando pela aldeia. Foto: Curt Nimuendaju, 1937. 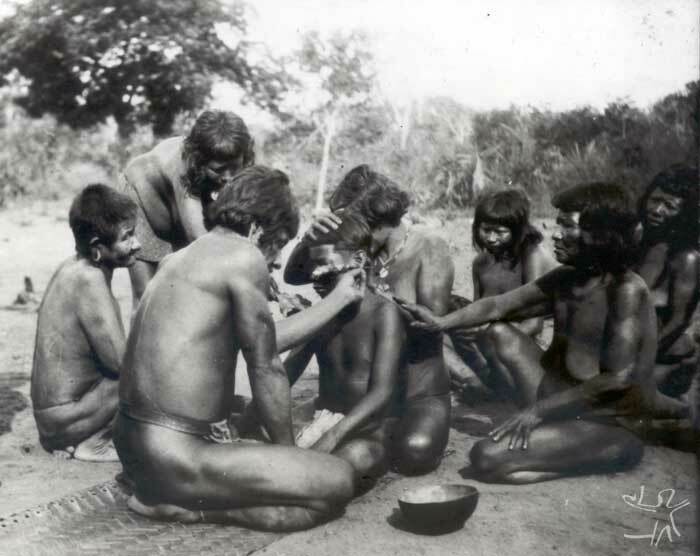 Like most indigenous groups of Brazil, for the Apinajé, the elements of "nature" (above all animals) are never learned as being unique or isolated, but as participants in a chain of relations that involves at the same time both humans and non-humans and non-humans amongst themselves. In this sense, hunting means interacting with symbolic forces of nature, for every game animal possesses a particular subjectivity (a "spirit" which defines the "character" of a specific animal species) that makes the relation of predator and prey a relation between subjects. Mythology also emphasizes the "humanity" of the animals, given that "before, all the animals could talk", as they say; the animals are seen as ex-humans, on this point, the indigenous view differs radically from the cosmology of the so-called Western society, for whom the "common" condition among humans and animals is "animality" (we are rational animals). In the Timbira view, the spirits of dead humans (carõ) undergo a series of metamorphoses, involving the use of the bodies of animals and plants as avatar, and in a regressive manner (from the higher mammals to the insects; from cultivated plants to "rotten wood", to finally be transformed into stone, thus no longer being able to communicate with the living). Besides revealing the Timbira view of the hierarchy implicit in the natural order, these metamorphoses indicate that, under the skin of a natural entity, the carõ can establish contact with humans, a contact that is always dangerous (it can lead to sickness and death) and which provides the subject who is contacted (if he accepts the terms "offered" by the carõ) the possibility of becoming a shaman (wajaka), thereby acquiring the power to maintain a permanent line of communication with the "other side" and the power to cure. Besides that, the natural world is peopled by "guardian spirits" of the species; these are unnamed agents (the ijãxycatê, the "owner" of the brocket deer, for example) which become manifest in the clothes of an individual species with some outstanding characteristic (size, strength, cleverness etc.). The "spirit guardians" communicate with the humans in dreams or in the liminal states that a subject passes through (sickness, seclusion), sending messages about the state of his "herd". For example, there are many stories in which in order to kill a certain type of game with frequency, the hunter begins to feel bad, becoming sick; soon after, there appears before him the ikraricatê saying that, if he wishes to recover, he should from then on refrain from killing that type of game and even from eating its meat. In this way, the "guardian spirit" regulates the stock of the species that it protects, acting as a kind of vector for the management and control of these stocks. The subsistence gardens - which belong to the women - are cleared in the galley forests or sloping land more or less distant from the villages, which are always located near small streams and on high spots, with a good view, preferably on the "plateau" (põpej) - on which the vegetation of the cerrado (srictu sensu) predominates. The men are responsible for the "broca" (pruning of the bushy vegetation), the felling of the trees and the planting of rice; the women participate in the sowing of the corn, manioc and other crops (broad beans, yams, beans, sweet potato, pumpkin, watermelon, peanuts, papaya, and bananas). In these forests, the soils are more clayish and rich in nutrients. The average garden size per domestic group is 1.5 hectares (or 0.5 hectares per nuclear family). The Apinajé gardens do not differ from those observed among other South American indigenous groups - but they do differ considerably from those of the neighboring regional population. Whereas the gardens of the regional population favor rice and manioc, which are planted separately, the indigenous gardens have a certain appearance of chaos, with an association of a wide variety of species. Rice, corn and manioc are planted first, with short intervals of time (November/December) in between and intercalated over the whole extent of the garden; after, yams and sweet potatoes are planted in specific sectors (January); after the harvesting of the green corn (March), the broad beans, and the "climber" beans are planted next to the cornstalks which are left to dry; in the remaining ridges of the garden, pumpkins are planted and finally, papaya and bananas are distributed throughout the garden. The useful life of a garden is determined by the manioc cycle (9 to 10 months) and the banana cycle. The Apinajé received as benefits of the agreement between the CVRD and the Funai (from 1982 to 1985), sophisticated agricultural tools and equipment. The "Funai" gardens cleared with this equipment have served, in the past more than today, to supply the Indigenous Post with a "surplus" (of rice basically) to meet its needs. The Indians on occasion received some part of this "surplus". Today, in the village of São José, gardens are still made using mechanized agriculture, but their production - subtracting the surplus from its costs - is distributed by the families of the village. Meat is indispensable in the festivals and, these days, many villages rely on cattle meat - and not game - for the purpose of the great rituals. Hunting no longer has the attraction it once did for the younger generations, principally when it demands a greater effort due to the scarcity of animals. Game is being substituted by the raising of small animals (pigs and chickens), which causes constant conflicts among families, because these animals are set loose on the terrain of the village and it is not uncommon for "someone" to end up killing an animal which belongs to someone else. The Apinajé villages situated on the south/northwest borders and connected with the São José Indigenous Post (Patizal, Cocalinho and São José itself), however, still have available a reasonable supply of game animals, despite the competition with clandestine hunters. In general, hunting is done with shotguns and, in the past, with bow and arrow. The collective hunts (which today are carried out with the help of dogs and not utilizing fire, as in the past) are done in the dry season, the ideal time for the holding of the great rituals. The technique used in the individual hunt varies with the season of the year: in the "summer" (dry season), the preference is for the "wait" (which the Apinajé adopted from the regional White men); in the "winter" (the rains), when the tracks are more visible, the preference is for trailing the animal. The term that the Timbira employ for hunting activity is synonymous for "frighten" (ajahêr), which reinforces the supposition that they learned the technique of hunting by waiting from the regional population. For the Timbira in general, the principal game animals are the following, in order of importance and gastronomic appreciation: deer (brockets, and field), tapir, armadillos (peba, china, true and leather-tail; the giant armadillo has disappeared), paca, cutia, anteaters (the small kind, for the striped anteater is ever more rare), quati, the capelão monkey, porcupine and rhea. The pigs (wild boars and peccaries) which once were abundant in the Apinajé area, principally in the forests of Ribeirão Grande, where the village of Patizal is located today, have practically disappeared. Among the Timbira, only the Apinajé eat the sloth, the tejú and the anaconda. Like every hunter-gatherer group, the Apinajé have a real passion for hunting: they dream a lot of game and hunts and tell stories in details, on the patio at night, of the adventures of each hunter’s day; this is the moment when they exchange information on game animals, their wily habits, behavior, and even their individual characteristics. The Apinajé also greatly appreciate fish, which still constitutes an important item as a substitute for game for individuals undergoing "restrictions" (persons in liminal states and, thus, under rigid food restrictions). Due to the scarcity of game, the villages situated to the northeast of the indigenous area fish almost daily. Besides fishing with hook and line, they practice the "tinguizada", collective fishing expeditions done in the dry season in small streams with the use of plant poison, or tingui (a toxic plant that cuts the supply of oxygen in the water making the fish appear "drunk"). Gathering activities of the Apinajé include fruits, medicinal plants, and thatch for construction and the making of domestic utensils (basketry). In general, one can say that the demarcation of part of the traditional area of the Apinajé contributed to diminishing their economic dependence on the surrounding society, and made the nearly total use of their territory according to the traditional ways possible once again as well as their abandonment of babaçu extractivism as the only way of getting money to acquire manufactured goods. The Apinajé, today, have merely an incipient relation with the regional market. In other moments of their history, for example at the height of the extractivist cycle of babaçu, this insertion into the regional market was quite strong, coming to represent, in terms of the value produced in the indigenous area, something around US$ 30-40 thousand per month. Presently, the insertion of the Apinajé into the market takes place basically through the purchase of industrialized goods on the local market of Tocantinópolis with the money that the retired elderly people get from Social Security, or that the Indigenous Health Agents get from the National Health Foundation or indigenous teachers from the state or even the young men get through their occasional work on the ranches of the region. The babaçu nut no longer has, as it did in the past, an important role in the acquisition of manufactured goods. MATTA, Roberto da. Um mundo dividido : a estrutura social dos índios Apinayé. Petrópolis : Vozes, 1976. 256 p. (Antropologia, 10). Apresentado originalmente como Tese de Doutorado. 1970, Harvard University. --------. Uma reconsideração da morfologia social Apinayé. In: SCHADEN, Egon. Leituras de etnologia brasileira. São Paulo : Companhia Editôra Nacional, 1976. p. 149-63. --------. A reconsideration of Apinayé social morphology. In: GROSS, Daniel R. (Ed.). Peoples and cultures of native South America : an anthropological reader. New York : The American Museum of Natural Story, 1973. p. 277-93. NIMUENDAJÚ, Curt. Os Apinayé. Belém : MPEG, 1983. 146 p.
OLIVEIRA, Christiane Cunha de. Some outcomes of the grammaticalization of the verb 'do' in Apinajé. Santa Bárbara Papers in Linguistics, Santa Bárbara : UCSB, v. 8, 1998. ----------"Lexical categories and the status of Descriptives in Apinajé (Jê)\". International Journal of American Linguistics no. 69, v.3: 243-271. 2003. -----------. "The language of the Apinajé people of Central Brazil\". Tese de doutoramento. Eugene (EUA): Universidade do Oregon, 2005. This page was last edited on 26 March 2018, at 16:48.